I had a problem with my Sidi Ergo shoes. It’s not that they’re just too bling (no empirical evidence suggests that such a state exists). 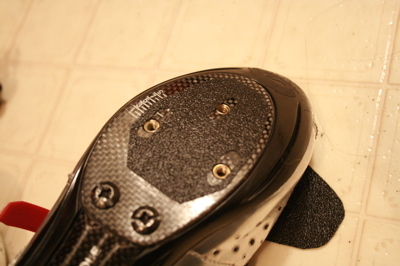 No, rather the cleats keep working themselves loose on the smooth carbon sole. Most irritating. 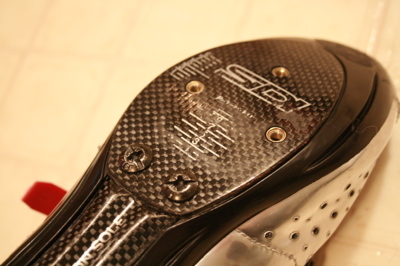 A lot of carbon shoes nowadays have a high-friction surface in the cleat area to combat this problem, but if your shoes lack this, then I’ll show you how to solve this. First, you go to the hardware store and buy yourself some all-weather adhesive floor tread such as 3M Safety-Walk. You won’t need much, of course, so you’ll probably end up with a lot of extras. Trace your cleat on the paper backing side, including the mounting bolt slots. Cut out the shapes with some scissors that you don’t care about, or use a box-cutter with replaceable blades. That latter will be better for the mounting slots anyways. This is the hardest part when you place the Safety-Walk sticky side down on the shoe where the cleat will be. Maybe mark the position of the cleat beforehand with masking tape or grease pencil. Oh yeah, that looks good. Now when you put the cleat on, it won’t slip even under hard pedaling. Bonus: the cleat position is well-marked for future replacement.